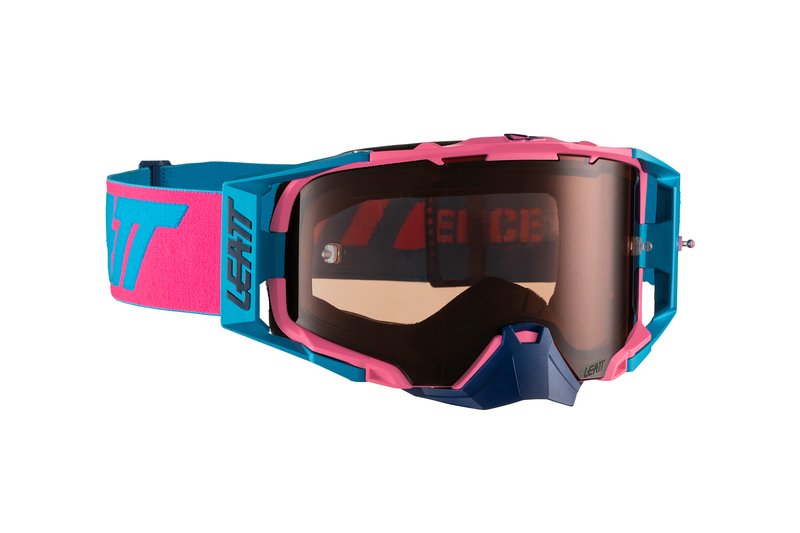 The inventors of the Leatt-Brace® just announced the launch of their brand-new range of goggles. An exciting new addition to Leatt's growing range of products, the Velocity goggles were developed with WideVision anti-glare, anti-fog tech and 2.7mm military spec lenses. The range consists of three types of goggles, namely the 6.5 Iriz, the 6.5 and the 6.5 Roll-Off goggles. Designed to work in all conditions, to fit well, and the lenses of the goggles are bulletproof tested and certified to: ANSI Z87.1-2015, CE EN 1938 :2010 and Military ballistic standard (MIL-DTL-43511D), making them super durable. They are all equipped with a 170° WideVision Anti-Fog, easy clip-in/out lens and a self-draining frame/lens design. The mean-looking Leatt bulletproof goggles are made to military specification, tough enough to look the Thrill right in the eye without backing down! Full Goggle Range: Find out more here. Tech video: Watch all the Leatt goggle tech here. 2019 Leatt Velocity goggles - Pink Cyan.